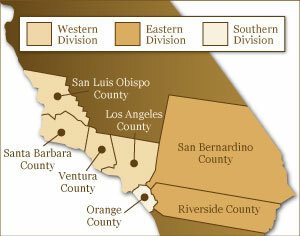 The Interpreter Services Department provides language support locally to the court’s locations (Los Angeles, Santa Ana, Riverside, and Santa Barbara). Spoken-language Interpreters are appointed in proceedings instituted by the United States. In all other proceedings, it is up to the parties to contract and compensate interpreters. However, it is the policy of the Judicial Conference that all Federal courts provide reasonable accommodations to persons with communications disabilities in all court proceedings, including sign language interpreters or other appropriate auxiliary aids and services. For fee schedules applicable to interpreters working with Criminal Justice Act (CJA) appointed attorneys, please refer to the Criminal Justice Act section of the Attorneys page of the court’s web site. Refer to section 7.3 Cancellation Fees in the Purchase Order Terms and Conditions. The Interpreter Services unit of the United States District Court, Central District of California schedules interpreting service for the court and for other court-related agencies such as U.S. Pretrial Services and U.S. Probation. The unit schedules interpreters for in-court proceedings instituted by the United States; for events incidental to court proceedings, during the same time period of service and in the same general location that services are provided to the court; for pretrial & probation interviews; and for the sight-translation of pre-sentence investigation reports. For a description of which proceedings qualify for appointed interpreters, please refer to sections (a) and (j) of the Court Interpreters Act. For cases that do not qualify for appointed interpreters, please refer to the court’s on-line local roster or other sources for names and telephone numbers of interpreters. You may also contact Interpreter Services at 213 894-4370 for additional information. Defense counsel should contact, contract, and pay for interpreters when their services are needed for attorney/client meetings away from the courtroom. Appointed counsel may refer to Scheduling Out-of-Court Interpreters in the Criminal Justice Act section of the Attorneys page of the court’s web site for guidance as to rates applicable to interpreting and translating service. In most instances, written translation of documents is an expense that parties must bear. The use of the general authorization for court interpreting is not appropriate for paying for translation of documents. If a non-English-speaking defendant or other participants in a court proceeding need to be advised of the content of an English-language document, this should be done by means of a sight translation, where an interpreter orally renders the document into the foreign language. When interpreters are needed for prosecution witnesses for in-court proceedings instituted by the United States, the United States Attorney’s Office secures contract interpreters as needed. When interpreters are needed for defense witnesses for in-court proceedings instituted by the United States, defense counsel should notify the courtroom deputy clerk, who will then place a request with Interpreter Services. If the language needed by the witness is the same as the defendant’s, it is customary for the proceedings interpreters to also interpret for the defense witness. As with any interpreter requests, Interpreter Services must be notified of any changes, continuances, or cancellations as soon as possible in order to avoid late-cancellation situations. For a description of which proceedings qualify for appointed interpreters, please refer to sections (a) and (j) of the Court Interpreters Act. For interpreter assistance during attorney-client meetings, or when appointed interpreters are not indicated, counsel may refer to the links below. Appointed counsel may refer to the Criminal Justice Act section of the Attorneys page of the court’s website for guidance as to rates applicable to interpreting and translating service when such service is not incident to a court proceeding on the same half or full day. Please be aware that in order for interpreters to be admitted into federal detention facilities and courthouse lock-up areas, interpreters must display a picture identification. Interpreters are not admitted into the Metropolitan Detention Center or similar facilities without being accompanied by counsel or other legal representatives, or probation/pretrial officers. AO certified: the interpreter is certified by the Administrative Office of the United States Courts. Certification testing is currently available for Spanish. ATA certified: the interpreter has passed an examination offered by the American Translators Association in a language pair for which examinations are available, and has met requirements to maintain certified status, if any. CA certified: the interpreter has passed the required exams for a language for which the Judicial Council of the State of California requires certification, and has met requirements to maintain certified status. A current list of languages requiring certification is available at California Courts, Court Interpreters Program, Certified Languages. CA registered: the interpreter has passed exams required for registration for a language for which the Judicial Council of the State of California does not require certification, and has met the requirements to maintain certified status. A current list of languages for which registration status is available is at California Court Oral Proficiency Exam Information. RID certified: the sign language interpreter holds a certificate in one or more levels of proficiency evaluated by the Registry of Interpreters for the Deaf. Click here to view the Local Roster of Interpreters. Click here to view the California Judicial Council’s listing of interpreters. Click here to view the American Translators Association’s listing of translators and interpreters. Thinking of becoming an interpreter? The first requirement is near-native fluency in English and one other language. To find out more about the interpreting profession, visit the California Judicial Council’s website for a comprehensive introduction to court interpreting in California. For purposes of the United States District Court, the Court Interpreters Act of 1978 (PL 95-539) requires the Director of the Administrative Office of the United States Courts to prescribe, determine, and certify the qualifications of persons who serve as interpreters in federal courts, when the Director considers such certification to be merited. Currently, federal court interpreter certification testing is administered only for Spanish. Spanish is the language most frequently requested in the United States District Court, Central District of California, followed by Korean, Mandarin, Armenian, Vietnamese, Cantonese, Russian, and Farsi. Interpreting services for approximately 50 different languages are provided by the Central District of California each year. There are currently five Spanish staff interpreter positions (no vacancies), and the court’s local roster contains the names of interpreters of more than 80 languages. The Administrative Office of the United States Courts classifies three categories of interpreters. The United States District Court, Central District of California also recognizes California Certified Interpreters (for languages other than Spanish), and California Registered Interpreters. Information on the certification program is available on the Federal Court Interpreters page on the United States Courts website. The following is a list of some professional interpreter and translator organizations. This is not a complete list, and does not constitute an endorsement of any of these organizations. It is provided for informational use only. This section contains forms for use by interpreters on the court’s local roster when the interpreters have been contracted by Procurement, U.S. District Court, Central District of California and scheduled by Interpreter Services, U.S. District Court, Central District of California. See CJA Forms when scheduled by attorneys under the Criminal Justice Act, and Public Voucher for Purchases and Services Other Than Personal for work done for the U.S. Attorney’s Office. I-2, Contract Interpreter Invoice - This form should be used for all in-court work, and all work incident to a court appearance during the same half day or full day; pretrial and probation interviews; and sight-translation of pre-sentence investigation reports. The interpreter must be contracted by Procurement, U.S. District Court, Central District of California and scheduled by Interpreter Services, U.S. District Court, Central District of California. Submit invoices by email to CACD_Interpreters@cacd.uscourts.gov. I-4, Contract Court Interpreter Request To Be Included in the Local Roster - Requests currently are accepted only for languages other than Spanish. Requests should be submitted by email to CACD_Interpreters@cacd.uscourts.gov.